Paper or digital Bibles? Yes, please! I met with the Digital Bible Society in Texas. I got the epub output from Haiola working for the first time, yesterday. See the story, below, for why this is important. It was definitely worth the trip to Vanuatu for the Pacific Wa'a meetings. 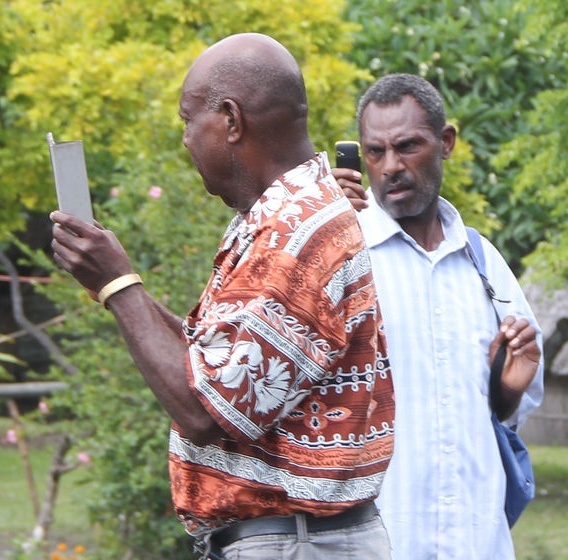 Personal relationships are very important when working together in Melanesian cultures, and the fellowship with brothers and sisters in Christ in Papua New Guinea and Vanuatu is sweet. Having met face-to-face, we will be able to work together more effectively in our combined mission of translating and distributing God's Word. We marched about a mile into a village for the Whitesands Tanna New Testament dedication. Leading the parade were some local scouts, carrying a box of Bibles on their shoulders like the Ark of the Covenant. 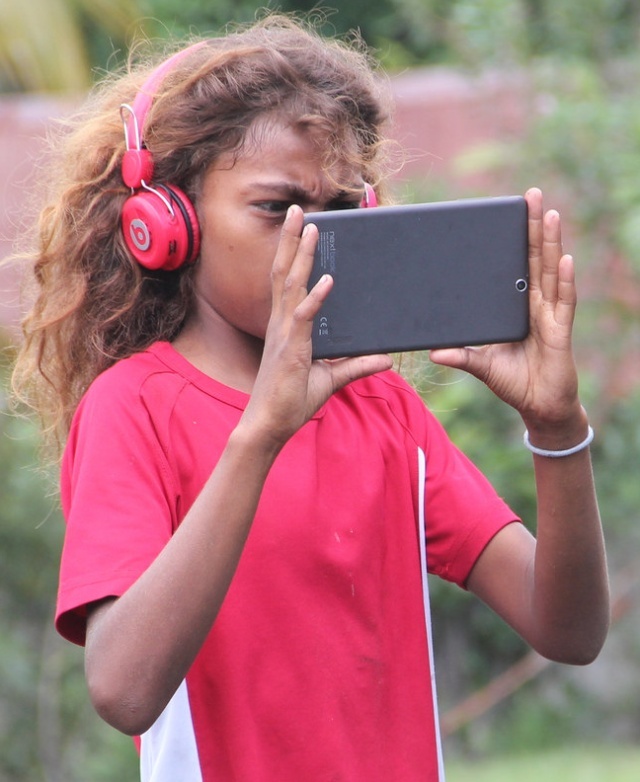 As we entered the village, which has no commercial electrical power, we were greeted by some people recording images of this event. In the picture above are a man with an iPad and another man with an Android smart phone. On my own travel smart phone, I observed usable signals, including Internet service, from two carriers. The Internet connections are slow and expensive, but they are there. I got the Whitesands New Testament online at VanuatuBibles.org just before the dedication. This man asked me how to get the Bible in his language onto his Android tablet. At that moment, the answer was more complicated than I would like. Because the Internet connections there are slow and not always available, reading directly from the web site isn't always an option. Downloading the HTML .zip file and expanding it on his device, then opening the index file with a browser is something not many people would find easy. Now we have a better answer: epub files. Just download an epub file and open it in a good epub 3 book reader app or device. I am generating epub files now, and will be adding links for 644 Bible translations in epub format to various web sites this coming week. 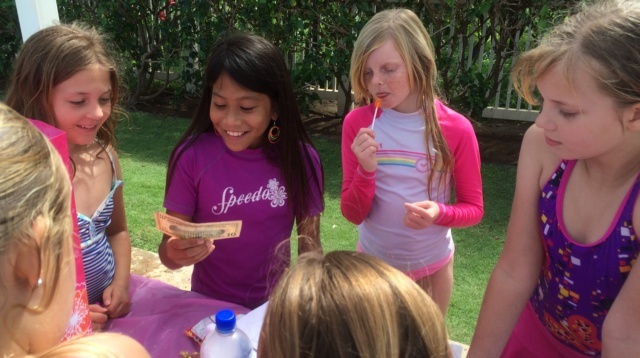 Rachel really enjoyed her 10th birthday party with friends and 2 of her big brothers. Both Nate and Evan are living with us, now. We enjoy having them with us. Praise God that Nate found a full-time paying job at the UPS store, and that Evan is working full-time for the Maui County Fire Department! This girl in the village where we held the Whitesands Tanna New Testament dedication appeared to be comfortable using her Android tablet computer. 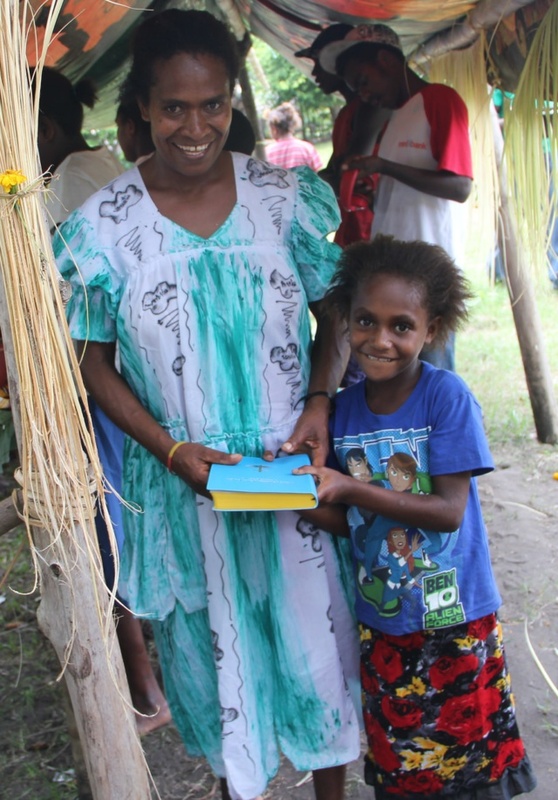 This mother and daughter were very happy to get a New Testament in their own language. Over 700 New Testaments were distributed on the first day. 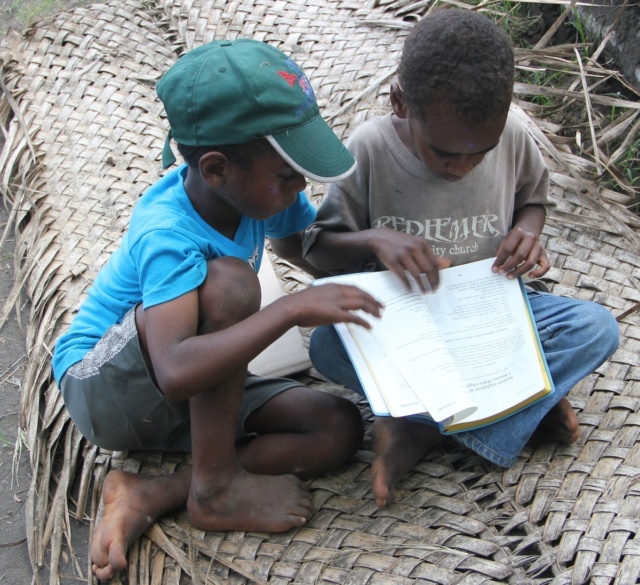 These boys were fascinated by the New Testament in their own language. 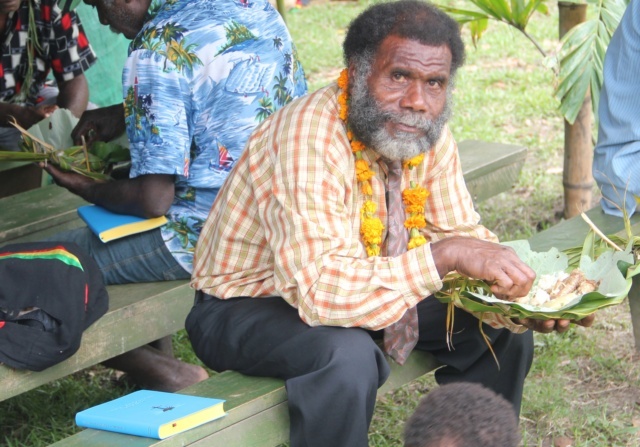 At the Whitesands Tanna New Testament dedication, we heard what sounded like thunder. It wasn't. 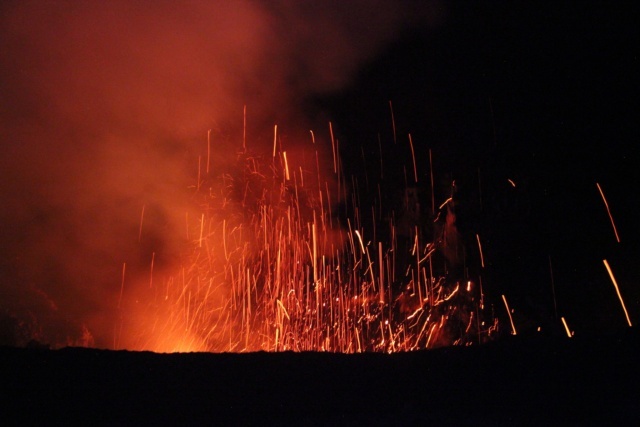 It was Mount Yasur erupting. After the dedication, some of us climbed to the top of Mount Yasur for a closer look. The fountaining lava and billowing sulfur fumes were impressive, as was the sound. Standing there on the edge of the cinder cone, I kept thinking about Jesus saying that the gates of hell shall not prevail against his church. We do have some impressive opposition, but we have much more impressive authority in Jesus Christ to live as God has called us to live. Thank you for continuing to pray for us! It helps more than you may know!